Alexander(kin) doll from late 50s/early 60s? 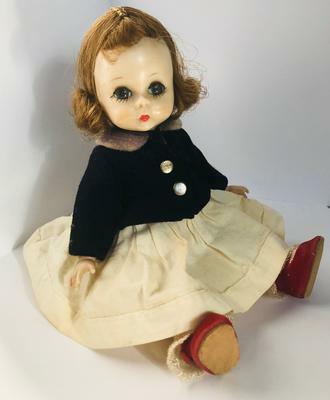 I received this doll from my parents in the late 50s or early 60s. It is 8", so I believe it is what as known as an "Alexanderkin" doll. The outfit she is wearing is probably the original that came with her. The navy of the collar has somehow bled slightly into the collar, plus the skirt has yellowed over the years, and she has some strands of hair out of place. Does anyone out there have more information about her?